Anything unrelated to elephants is irrelephant. : A rainy day is a happy day in Botswana. Last night was (surprisingly) the first time my candles have generated a problem. Boi finally lit her tail on fire. Luckily, I saw right away how stupid she was and blew out the small flame. She proceeded to get pissed at me for blowing on her and began swatting me with her less-than-ferocious little paws. I’m now accepting ideas for cat proof candle holders. I even considered super gluing candle holders to the wall, but decided against that. I don’t think my landlord would appreciate a $1 candle holder inexpertly glued to her wall. The big exciting news of my life is getting a new (to me) big bed! I can have visitors stay the night now, and they don’t even have to sleep in a hammock! I’m planning on having a little gathering at some point soon. 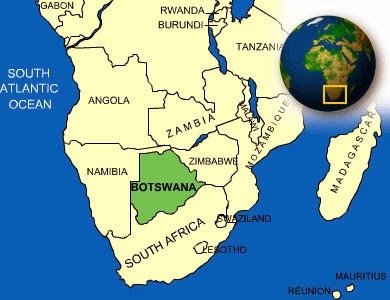 Also, next week all 130(ish) Botswana volunteers are heading down to Gabs for the first ever all volunteer regional meeting. It will be exciting to meet all the volunteers from all the Bots groups, most of the volunteers have never met some of the other groups. Last week I went to the primary (elementary) school to talk with the headmistress about downloading a fun typing program onto the 14 computers in the lab. She took this to mean I wanted to start teaching computer lessons and that I should probably do it four days a week. I talked her down to two days a week, and even that I thought would be something I did not want to do, but I reluctantly obliged. I went in yesterday, with absolutely no idea what to teach them except how to open the typing program, but turned out I had TONS to teach them. There were about 30 in the class (standard 6-age 11ish) and about 95% of them had never touched a computer. It finally dawned on me that it didn’t matter how little I knew about computers, I could teach them anything and it would be new. We started with the basics; it involved how to hold the mouse, and how to click the mouse. Watching them struggle with the mouse, I could see how foreign it was for them to use their hand that way. The right click and the left click on the mouse were hard concepts to grasp, but toward the end of the hour, most of them had gotten it down. I realized that this is how I probably look to them when I try to do anything new here in Botswana, like dance or make bogobe (porridge). I never remember being taught how to use a mouse, it seems like such a innate ability for anyone in America because we have used computers since we were seven (probably like two now, who knows). Overall, I really enjoyed the class and the hour flew by; this means I am excited for my next class today! They cannot wait to play games, but I figure they should learn how to open a program first, then they can move on to the really fun stuff. It’s really exciting to be the one to teach them such a useful skill. Technology is becoming more prevalent in Botswana and when they go to University (and they better go! ), they will need to know how to use a computer.